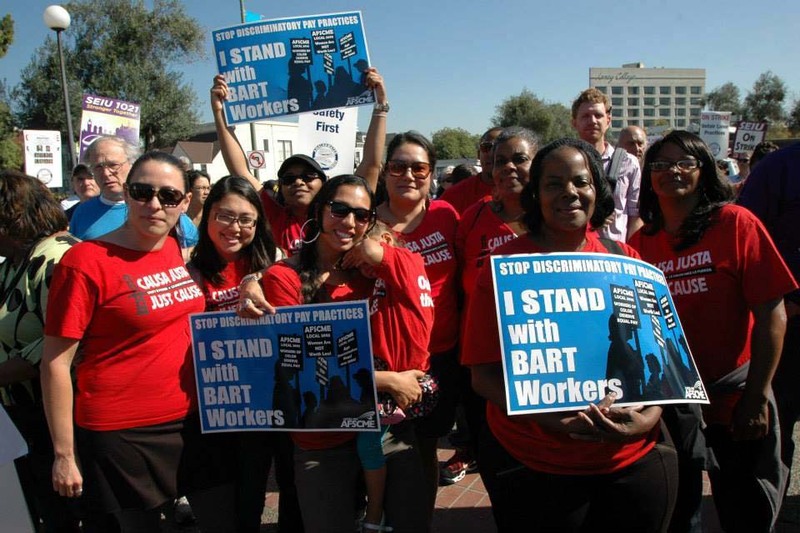 The Bay Area Rapid Transit (BART) worker strike has come to a close. After tense negotiations, a tentative agreement has been reached, after workers demanded the restoration of salary cuts and safety measures. In a heartbreaking confirmation of the need for safety measures, two workers were killed this weekend when a scab in training attempted to move a train in Walnut Creek, as the management prepared to run trains despite the strike. This tragic event may have helped push the BART Board to come to the bargaining table with a little humility, or, anyway, some fear of the public opinion. In the context of this strike, the whole Bay Area has been alive with political conversations – every carpool line, every bus, every twitter account is touching on the topic: How could these tragic deaths have been prevented? Who should be held accountable for the commuter delays? Whose side are you on? And, yes, it must be noted, as it often is in these conversations – BART workers make higher wages than fast food workers, domestic workers, or the millions of young people who are under-employed. Why? Because the public sector in the Bay Area is a highly organized force. Because they have fighting unions, and by working together, they are able to leverage the power they have to decrease how much they are exploited. Nothing like a strike to make clear just how much power workers have to make themselves heard. So much so that conservative legislators are even trying to push a no-strike law specific to transportation workers. The issues at the core of the BART strike are bigger than a commuter delay, bigger than a single contract fight, bigger than the sensationalist newspaper headlines, and we need to approach it that way. We are facing a core aspect of the neoliberal transformation of our communities. Corporate interests seek to remove protections to living wages, health benefits, worker protections, environmental standards, and democratic community control. 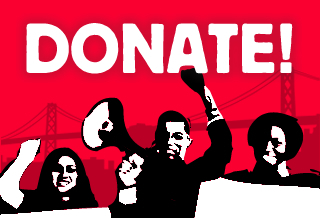 The corporate agenda that BART workers are up against doesn’t just seek to lower their wages and security standards – it also invests public money into police, prisons and the military instead, turning the public sector into a machine of repression, and hammering away at the parts of the public sector that benefit the community. The “public private partnership” that BART is allegedly built on has done little to advance the interests of the public. The “private,” which is to say, corporate, side of the partnership is clearly running the show. As a long time Bay Area community organizer and resident, like everyone else, I have relied on BART trains to get me where I needed to go, and, like most people in my community, I support the strike. Causa Justa :: Just Cause was built from a merger of a San Francisco-based organization and an Oakland-based organization. How did our disabled, elderly, and parent members get from one office to the other, to discuss how to build Black and Brown Unity, to mobilize to each others’ actions, to bring the costumes to the community room for the member talent show? You guessed it: BART. It wasn’t the managers who took us where we needed to go. It was the workers: the grandmothers, the brothers, the transit-dependent families who make BART run. Just like they were there for us, we at Causa Justa :: Just Cause mobilized to be there for them. This wasn’t a fully thought out organizational partnership between Causa Justa and the unions representing the workers; it was messy, real-time emergency response solidarity. And it’s an important start to a bigger conversation that our local chapter of Jobs With Justice is creating the space to have. The history of collaboration between community groups like CJJC and labor unions includes plenty of challenges. And this moment in history presents a unique opportunity to reconnect the dots. We have to connect labor and community, across the differences in our priorities and bridging our unique political cultures. Public transportation is a core feature in the lives of the public in the Bay Area, and is an important arena of struggle. Gentrification and Displacement have pushed working class people of color hours away from the places where they work, and BART is part of their daily lives. Nothing drives that home more than the 1.5 hour BART ride Causa Justa :: Just Cause member Thea Cushman takes from Antioch to rejoin her former East Oakland neighbors for a meeting once a month. Displaced by a Wells Fargo foreclosure, and again by a US Bank foreclosure of the unit she rented, Thea knows all about how corporate control is displacing working class communities. In fact, I sometimes dream of a campaign inspired by allies in transportation work – a push to lower fares to make the system more accessible to the working class people who depend on it, instead of have it be such a service of convenience for drivers who want to avoid traffic. People Organized to Win Employment Rights won free fast passes for San Francisco youth to ride the MUNI bus system. What would it take to win something like that at a regional level? For one, it would take a level of organization that is regional. Right now, BART workers are the single largest organized force able to take on BART management. It’s no coincidence that despite tons of community support, the newspapers only reported commuter complaints. The BART workers present a real threat to corporate interests in our region, and they will use all the means at their disposal to discredit the workers. This heroic strike has inspired millions of public sector workers throughout the country with its militancy. And it is just the beginning of what we need to do. Each contract fight, each community demand, each governance body needs to be linked to our long-term movement project of building unity across sectors, so that working class communities as a whole can take our whole region back.